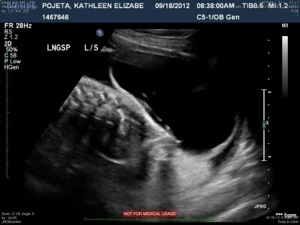 As mentioned, we had a full diagnostic ultrasound done on September 18, 2012, exactly one month before our due date. 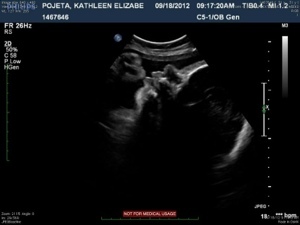 This is what led to the diagnosis of Spina Bifida, and the revelation of our third child being a boy. In order to lay the groundwork for what is coming our way, I wanted to include the findings on the blog for those of you that are more medically inclined or just inquisitive. And for our own collection of notes, as this blog will eventually be converted in part to Colten’s printed baby books. Snippets from the “Obstetrics Report”… Mostly I included basic stats and any abnormalities. There are so many statistics and observations on this report that I do not know what they represent. Below are abnormalities or facts of interest only! There are many items on the actual report that are listed as “suboptimal imaging” due to Colten’s size (harder to see with so much body in there this late in the game) and/or his position with his feet and hands up by his face. In the end, it doesn’t matter that they couldn’t get everything they wanted to view because there’s nothing we can do now except wait and see. Breech presentation with back down. Bilateral Ventriculomegaly 1.5cm diameters each side. 3rd Ventricle is enlarged (3mm). Posterior fossa difficult to evaluate but cerebellum still has normal shape (not banana sign), however the Cistena Magna only measures 2mm (small). CSP is not well seen, however this may be due to fetal lie limitations and breech. There appears to be pericallosal artery coursing around the anterior, sugesting the presence of the Corpus Callosum. Head shape suggestive of “lemon sign”. One foot may be clubbed. Contralateral foot difficult to see. Large cyst in the lower back of fetal spine (sacral area). Measures ~10cm in diameter, and contains multiple strands/septations which appear to be eminating from the fetal lower spine. Due to fetal breech back down position, it is difficult to see the L/S bony structure well. I see a skin defect in one transverse view. This constellation of findings suggestive of OPEN SPINE DEFECT: I suspect this is in the sacral area, but may also involve the lower lumbar. The 1st point could be indication of hydrocephalus (fluid around the brain) which is extremely common in children with Spina Bifida. Many kids with SB require a shunt to properly drain this fluid into the abdominal cavity. This is something that could be present right at birth or could develop later. Ideally the measurement here should be 1cm, or 1.4cm on the larger, safe side. So Cole is measuring just a bit beyond that which puts him borderline. The 2nd point could be an indication of a chromosome issue, such as Trisomy 13 or 18. Sometimes Spina Bifida occurs on its own, sometimes it comes as a result of a chromosome problem. This is something we won’t know until after birth. Deformaties and weaknesses in the legs/hips are common in children with SB anyhow, so this could simply be that. A clubbed foot or feet would be braced and treated as needed, surgery if required. The 3rd point is the tell-tale sign of Spina Bifida. The sac/cyst is about 4″ – a pretty big size, but seems to sit low on the spine. The lower the better, generally speaking. The sac being ONLY on the sacral area is as ideal as we can get. Moving into the lumbar region will just mean more challenges. This image shows the bottom portion of the spine (lumbar and sacral). The large black area surrounded by a jelly-bean type shaped white line is the cyst, or sac. The next four images just show various views of the strands/septations that are visible within the sac. 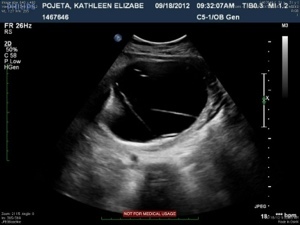 This entry was tagged prenatal, ultrasound. Bookmark the permalink. Kate, we really appreciate this information/updates. Know that Colten is a very much loved grandson.